Celtic Players triumph in China. 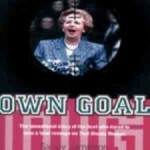 Part Two – Mowbray a better judge than Lennon? Maybe it is something in the Glasgow air, but after Du Wei’s total failure to adapt to Scottish football, the second Chinese internationalist signed by Celtic did not fare much better and only stayed a year. Zeng Zhi was another signing which at the time was hailed as a very good piece of work by Celtic. 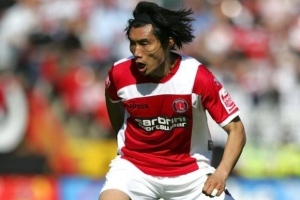 An established internationalist in China he had been signed for £2 million pounds in August 2007 by Charlton Athletic after a successful loan spell. He started very well and was soon being rated as a very talented player, gaining recognition by professionals and fans alike. Tony Mowbray tried to sign him for West Brom in a multi-million pound swoop in August 2008 but the deal collapsed at the last moment. However Mowbray, by then Celtic manager, finally got his man in September 2009, on a free transfer, his contract at Charlton having expired. “He will significantly add to the squad with his quality” Mowbray promised. Mowbray backed this faith by allowing Zeng Zhi to make his debut in the October Old Firm game. Zeng Zhi went on to play for Celtic another 15 times, scoring once, a spectacular effort against Hearts. He got a mixed response from Celtic fans but the general consensus was that while he had class, he lacked application. It became obvious that Mowbray’s replacement Neil Lennon did not share the same high opinion of him, indeed did not rate him at all, and there was no surprise when he was released in June 2010. Like Du Wei before him he returned to China to lick his wounds and restore his reputation. To general surprise he signed for a Second Division club, Guangzhou Evergrande, despite many offers from top flight clubs in several countries. Guangzhou had been forcibly relegated at the end of the 2009 season for their involvement in the 2006 match fixing scandal that nearly destroyed completely the creditability of Chinese football. However the club under the control of wealthy new owners Evergrande, determined to rebuild and return quickly. They invested money in experienced international players and were already well on course for promotion when they made Zeng Zhi a financial offer that compensated for the lack of first division football. With Zeng Zhi making a very positive contribution, Guangzhou easily won the Chinese Second Division in 2010 to regain their place in the elite. Zeng Zhi was made captain as Guangzhou reinforced heavily for their return to the top flight. Two top class Brazilian forwards were signed Muriqui and Cleo, bought from Partizan Belgrade for 5million euros, to add to Chinese internationalists Gao Lin and Sun Xiang. But the most sensational transfer of all was the 10 million euros they paid for Dario Conca a massively talented Argentinian playmaker who in 2010 was the outstanding player as Fluminense won the Brazilian League. For the first time, a world class player at the peak of his form was attracted to play in the Chinese League. Under Zeng Zhi’s captaincy the team played well and quickly established themselves as by far the best team in China. Crowds grew to record levels of 50,000 and Guangzhou rewarded them by clinching the Chinese League last weekend with 4 games to go. It was the first time a promoted team had won the Chinese League. In some ways, Guangzhou are the Manchester City of China and will push other Chinese clubs down the same road in order to compete with them. Zeng Zhi’s major contribution to this title success was recognised when he was restored to the Chinese national team where he was reunited with Celtic’s other Chinese player, Du Wei. Zeng Zhi and Du Wei had encountered each other before in the Chinese national team, with Du Wei taking over the captaincy from Zeng Zhi. New Chinese national team manager Jose Antonio Camacho made it clear both ex-Celts were going to be key members of his World Cup squad but he decided that of the two he preferred Zeng Zhi as his captain leading from midfield, while leaving Du Wei in charge of defensive organisation. On 11th October the Chinese bid for World Cup qualification hit an early rock, when the team were shocked at home in Shenzen by a 1-0 defeat by Iraq. This shock defeat left China in third place at the halfway stage of the Group, with 3 points from 3 games, 3 points behind Iraq and 6 behind unbeaten surprise leaders Jordan. China may well need to win all three of their remaining games to guarantee finishing in the top two qualification spots. Otherwise the world’s biggest country, with its increasingly football mad population, could face elimination from the 2014 World Cup more than two years before it is due to start. It will take all Camacho’s considerable powers of motivation and organisation to ensure China advance from their first stage Group. But Camacho remains clear that Du Wei and Zeng Zhi are international class players who will be key components in his efforts to achieve this qualification.